I was thumbing through my favorite cookbook earlier today and saw a note that reminded me that my Aunt Suzy gave it to me as a gift for my bridal shower two years ago. The cookbook is The King Arthur Flour Baker’s Companion: The All-Purpose Baking Cookbook . Part of my excitement of receiving this cookbook was that it came from the King Arthur Flour Company, which is, in my mind, an expert in the baking industry. The cookbook cover is simple yet attractive with bright colors. More importantly, it is considered a “soft cover” and is sturdy and slick which helps prevent it from being damaged by cooking messes. And I am a messy cook! It is organized into thirteen chapters that each focus on different baking styles, such as Quick Breads, Yeast Breads, Sourdough, Cookies and Bars, Cakes and my favorite category: Pies, Tarts, and Quiches. 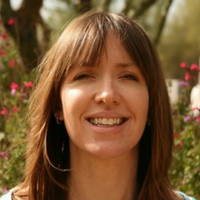 Among the chapters are two that focus on ingredients and tools. In the introduction there are also two sections that focus on measuring and high-altitude cooking, with the latter being of particular interest to me because I live at 9000 feet elevation. The recipes in the index are cross-referenced, which means you can find “pumpkin pie” under “pie” and “pumpkin”. As noted above, there is an extensive 74 page chapter that focuses on ingredients. This chapter educates the reader about the most essential ingredient in baking: flour. It begins by describing wheat and its different varieties. Variations and uses of rye, corn, oats, amaranth, barley, buckwheat, chickpea flour, millet, quinoa, rice, teff, and triticale are also described. Milk, cream, cheese and eggs, including an introduction to fermented milk products, are discussed. Following that leavens, agents that lighten the dough, are described. And finally… fats, sweeteners, and other ingredients such as chocolate, vanilla, almonds, extracts, spices and herbs are addressed. Each recipe starts with an introduction that is at least a sentence or two, if not more; it explains why the recipe was chosen and sometimes includes the history of that style of recipe. For example the Simple Sugar Cookies recipe on page 294 mentions “that frugal Yankee housewives saw no sense in using more sugar than was absolutely necessary”. I wish I had the same problem! I need less sugar in my life. The recipes also list ingredients in the order that they are used throughout the recipe. Techniques in this cookbook are thoroughly described. This cookbook could even be described as part textbook, part cookbook. There is an eight page introduction dedicated to measuring and a three page section that addresses how to make adjustments to baking if you live at a high-altitude. And throughout the cookbook there are inserts to educate the reader about specific types of recipes and techniques used in those recipes. There are only 16 full color photos inserted into the middle of the cookbook. Otherwise a small portion of recipes have sketches included that help to illustrate the techniques that are being used. While I would have loved to have more full color photos, this cookbook is already 620 pages long, and to include photos would make this cookbook huge and impractical. In the last two years, I have tested a large amount of recipes throughout The King Arthur Flour Baker’s Companion cookbook. Most recently I have tested the Classic Yellow Cake on page 352 and the No-Knead Deep-Dish Pizza on page 248. 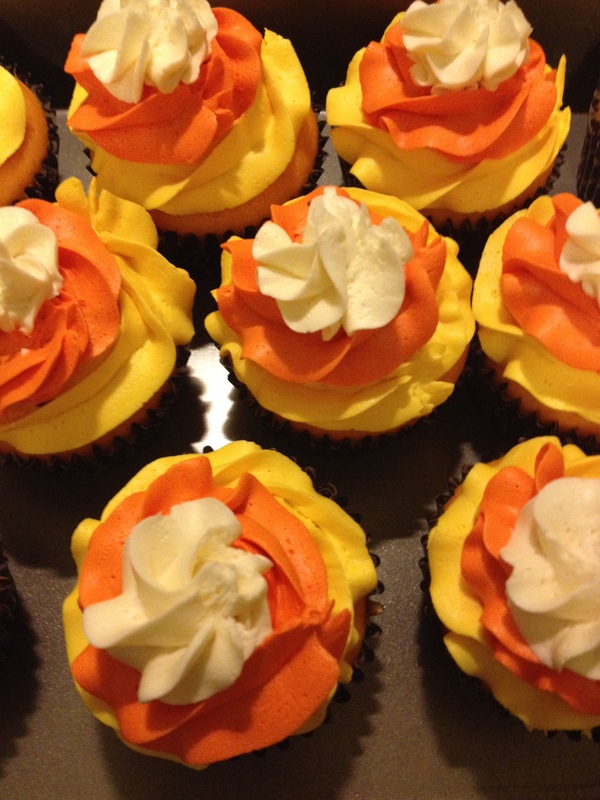 I used the cake recipe for cupcakes that I took to a Halloween party and they were a spectacular hit. I found the idea for decorating at a great blog called TheCurvyCarrot.com. I used recipes found in the King Arthur cookbook, but loved her style. Here is some of my finished product. 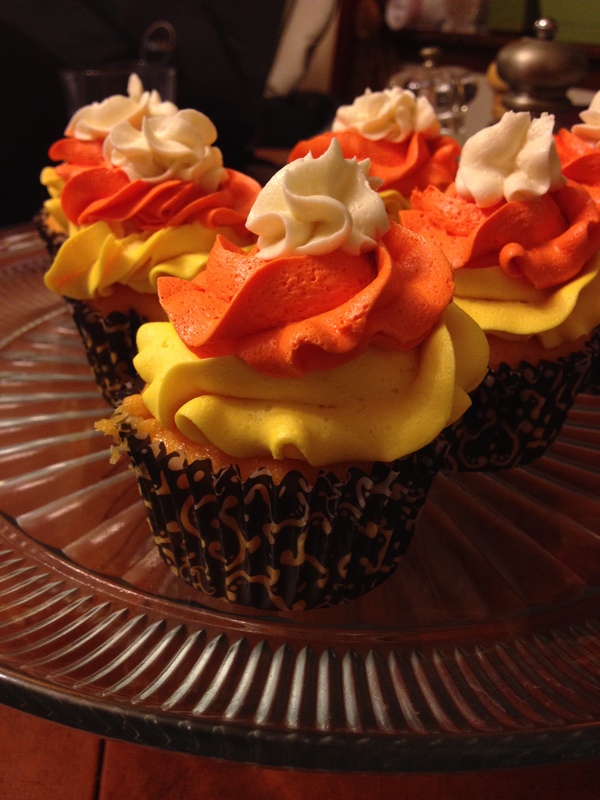 Check out The Curvy Carrot’s post about Candy Corn Cupcakes. I did substitute whey for milk, which the cookbook recommends in the ingredient chapter. This gave the cupcakes great flavor and reduced the fat content approximately 25 percent (537). I did increase the amount of the eggs in the recipe, based on the suggestion in the high-altitude section, to increase the liquid amount. The recipe did suggest that it is a great recipe to use for cupcakes, but did not suggest an amount of time to bake, so I guessed and baked them for 22 minutes. They turned out delicious! When I was growing up, my mom would always make homemade pizza. We live in a rural area, so getting a hot pizza from a restaurant is hard to come by; as a result, I decided to make a pizza from scratch like my mom used to. There are a few pizza recipes in the cookbook, but I chose one of the deep-dish recipes because it was quicker. Semolina was included in the recipe but I was unable to find it living in an extremely rural area. The cookbook does tell you what to do if you do not have semolina (just increase the all-purpose flour). I will probably order semolina off the internet soon. Even without the semolina the pizza was delicious. My husband and step-daughter loved it. I will definitely make this recipe again, although I would like to try some of the other pizza recipes too, because typically I prefer a thinner crust pizza. I highly recommend The King Arthur Flour Baker’s Companion if you are interested in baking. It has become my standby for any recipe that is baking related. Novices and experienced bakers can both learn a lot from it. As I mentioned before I received this book as a gift, but if you are looking to get a copy for yourself here is a link to Amazon. FYI – if you have a Amazon Prime membership there is a $5.00 discount on the list price.